LOS ANGELES -- Two men were shot and killed Wednesday at the University of California, Los Angeles, in what authorities said was a murder-suicide. At least three shots were fired in a small office in the Engineering IV building, LAPD Chief Charlie Beck said at a press conference. Authorities recovered a gun at the scene. The victim was William Klug, 39, a professor of mechanical and aerospace engineering, according to CBS News, TV station KABC and the Los Angeles Times. The shooter remained unidentified. than William Klug," Alan Garfinkel, also a professor at the school, told the LA Times. City Councilman Paul Koretz told The Huffington Post the motive was unknown. UCLA went into lockdown shortly before 10 a.m., after reports of a gunman on campus. The lockdown lasted about two hours, and Beck said the campus is now safe. The building where the shooting took place is off limits as police investigate, according to a campus safety alert. 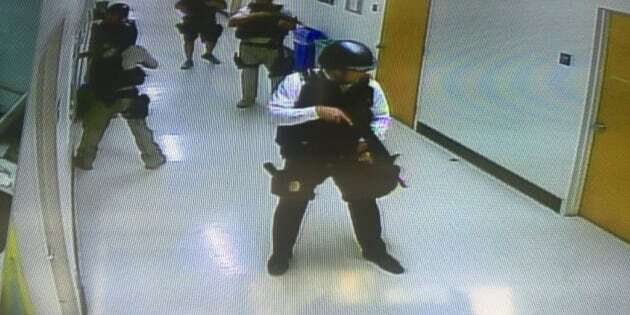 Images from the campus Wednesday morning showed officers in tactical gear with guns drawn going door to door, and students with hands behind their heads. A woman who said she was sheltered in an IT room tweeted CCTV photos of officers in a campus building. Located in the Westwood neighborhood of Los Angeles, UCLA is one of the largest universities in California. Spanning around 400 acres, the school is home to about 43,000 students, 29,000 of them undergraduates. UCLA is on the quarter system, and students are in their last week of classes, with finals beginning this weekend. The FBI and Bureau of Alcohol, Tobacco, Firearms and Explosives are assisting the UCLA Police Department and the LAPD in the case. After reports of a gunman, students were told to stay in place and lock doors. UCLA freshman Shola Akinrimisi, 18, spoke to The Huffington Post while on lockdown in his RA's dorm. Sophomore Zainub Ali, 19, described a chaotic scene as she emerged from her chemistry class near the engineering building. Students dashed away en masse when they heard someone yell “run!” she said. Linda Voorhees, associate director of screenwriting for film at the School of Theater, Film and Television, was on the phone with HuffPost when the lockdown was lifted. "The Bruin Alert came out very quickly. Once that occurred, we went into immediate protocol, which is shelter in place," she said. "It has really been like a ghost town in the right way, everyone has been inside." Umar Rehman, a third-year student, said he spent about three hours in an underground room with roughly 25 biology classmates in a building close to the shooting. With no lock on the classroom door, a student wrapped his belt around the hinge in the hopes of keeping any shooters from opening it, Rehman said. Rumors reached Rehman and his classmates that as many as four shooters with automatic weapons had attacked the school and that up to nine people had been shot. “When you have a lot of different stories and you don’t know what to believe, it’s definitely cause for worry,” Rehman said. “I did become very scared at one point where it was mentioned that [the shooter] was on the loose and making his way towards our building.” That rumor proved to be untrue too. Programming and classes are canceled for the remainder of the day, but are expected to resume Thursday, UCLA Provost Scott L. Waugh said in a press conference. Finals and commencement will occur as planned. "We will make counseling available for students, faculty and staff -- for anyone who may need it," he said. Wednesday's shooting at UCLA marks the 186th shooting on a school campus in the United States since more than two dozen people were killed, including 20 children, during the shooting at Sandy Hook Elementary in Newtown, Connecticut, in 2012, according to data collected by gun control advocacy group Everytown For Gun Safety.